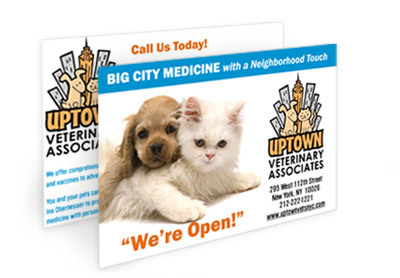 Direct mail marketing for your veterinary hospital can be an important asset for growing your business, thanks to its relatively low cost, its ability to reach specialized target groups, and its ability to provide immediate and measurable results. A well-crafted mailer can easily translate into large profits. Direct mail marketing allows you to reach potential clients who may not otherwise hear about your services either because they do not use the internet or do not frequent your website often enough to take advantage of promotions. 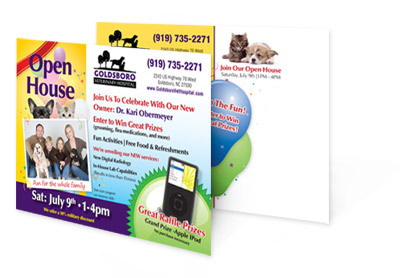 The success of a direct mail marketing campaign for your veterinary hospital depends on delivering the right message at the right time to the right person in the right way. The marketing experts at VetNetwork understand your target audience and have the skills to develop the appropriate message to motivate existing and prospective clients. As the only marketing company exclusively devoted to the veterinary profession, we have the knowledge and expertise to target any segment of the pet-owning population that you want to reach and show them the benefits of your services and products. Print and internet-based marketing, when used together, can provide a better experience for your clients and a better result for you. Together, they enhance the professional nature of your marketing message. Many high-end companies today are communicating with their clients first by email, then following up a week or two later by direct mail. The veterinary marketing staff at VetNetwork ensures that your message goes directly to the people you want to reach. To learn more, give us a call at 800-564-4215 or email us today.